Fish are awesome. And no, I don’t just mean for food. I meant as pets. In the UK and the US both, they’re the third most popular pets, just coming after dogs and cats. In fact, there’s a type of fish that could go with any kind of budget. Now I have allergies and can’t really have any of the furry, four-legged pets in the house so I decided to get myself an aquarium instead. I have some nice free space and decided to fill it with a 29 gallon aquarium. What I ended up buying was the Coralife BioCube 29 gallon aquarium. Dimension: 20 x 20.8 x 18.8 inches. All-in-one system with tank, light filter, filter pump. Integrated wet or dry biological filtration. 4-button control and separate power cords for daylight, actinic and LEDs. 265 GPH pump flow rate. Package comes with lights: 1 x 36 watt True Actinic 03 Blue, 1 x 36 watt 10,000k Daylight, 1 x 0.75 watt Lunar Blue LED Bar. Coralife BioCube Replacement Filter Cartridge, 2pk – $7.99. Coralife 29 Gallon BioCube Aquarium Stand – $144.99. Coralife BioCube Protein Skimmer – $30.99. 4-button controls and separate power cords – this makes for easier set-up of the lights for daylight and other options. Hinge-top canopy design – the lack of which was a common complaint against the Oceanic BioCube of the same size. Quiet submersible pump – resulted to improved water circulation and filter performance. Clear glass back panel for easier addition of accessories. Ability to add more modular LEDs. Of course, the new design remains compatible with all existing accessories for the BioCube line. 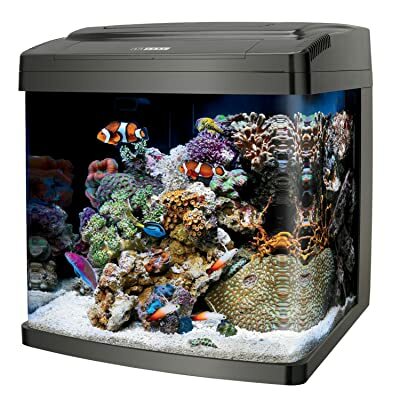 Experienced hobbyists will be happy to know that this 29 gallon aquarium has 3 rear chambers that are really designed very well and limits water evaporation. The second rear chamber, the largest of the three, is a great refugium. But even noobs like I was before will be glad to see that there are no issues with the pumps that came with the package. This set up is quiet and cooling fans aren’t noisy. Setting up and operating the whole thing is also very simple. One complaint I do have is how the lighting system tends to run hot, even with the cooling fans. I found it a bit of a challenge to install additional fans and was actually worried when summer rolled around. I did get that sorted out by getting a retro LED kit as suggested by one of my more experienced friends. 3 upgradeable LED bar slots. Lighting system can go hot despite the cooling fans.